"The ultimate charging station, this all-in-one AC Adapter includes iPod/iPhone charging dock , 3 AC surge protected outlets, 2 USB Ports, and a nightlight. All these features are packaged in a compact body that is both stylish and sleek." This thing does it all doesn't it? 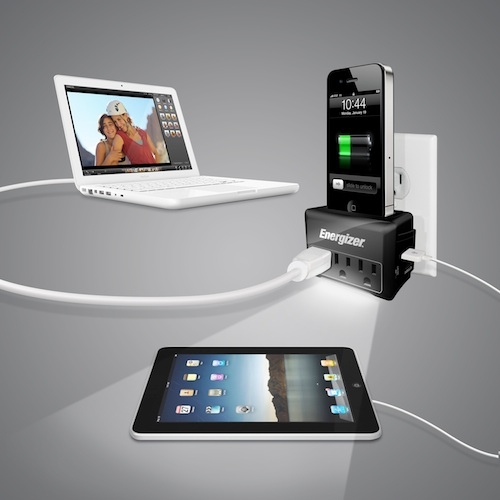 A compact package, called the iSurge Travel Charger, that allows you to charge several items via USB, and adds a couple of AC plugs for other devices. On top of that, it has a charging dock for your iPhone 4 and a light. The suggested retail is $59.95 USD, which seems pretty reasonable given all that it does. The product is due to launch in October of this year.